The economic case for government subsidies can be made in one of two ways. The first is the argument based on externalities: the idea being that one person’s behaviour creates benefits for others, but that those others do not compensate the actor. An example might be a landowner who refrains from cutting down trees uphill from rivers. All river users benefit from the flood control and lack of silt. In this case, it might make sense for the government to pay the landowner to save the trees – in providing the subsidy, the government encourages a more socially optimal behaviour. This justification doesn’t work for fisheries. Fisheries are a common property resource and, as such, tend towards over-exploitation. Having fishers catch more does not provide anyone else with benefits; indeed, it harms the ability of everyone else to use marine resources. Subsidizing fishing pushes fishers to continue catching fish even beyond the point where it would normally be unprofitable, leading to further depletion. The second argument for subsidies is the ‘infant industries’ argument. The idea here is that it can take a while for a new business to reach the level of existing businesses in the field. A brand new textile industry in an African state may not initially be able to produce goods at a cost and level of quality competitive with existing industries in Asia. In such cases, you can justify a temporary program of subsidy, intended to get the industry running. Once again, this doesn’t apply to fisheries. If anything, there is too much fishing capacity in the states that subsidize heavily (North America, Europe, and Japan). Excess fishing capacity is being exported into developing states, depleting the resources there. The one form of subsidy that can be justified in relation to the fishing industry is subsidized training to get out of it. We can recognize that fishers are having an increasingly difficult time making a living, while also recognizing that subsidizing their fuel or equipment will just batter fish stocks further. The solution is to help people to transition into other industries where they can sustain themselves without depleting pools of resources common to everyone. It is always hard for politicians to say that an industry should be smaller, or should not exist at all, but, in the case of fisheries, that is probably the only position that makes economic and ecological sense. Another form of subsidy that is justifiable is to pay fishermen not to fish. It’s also insane, but sometimes we need to balance sanity against electoral constraints. A third possible justification is public support for fishery subsidies, though that might lessen somewhat if people appreciated how harmful they are. There is no obvious reason why public support is the justification for a harmful thing. If something isn’t harmful or not harmful then public support is a good justification. Like, for example, public support is a good reason to fund the arts – but not a good reason to put a freeway through an unspoiled valley. You should put the freeway through if its the right thing to do, and in this case the people count but not inasmuch as they “support it”, rather inasmuch as it is in their interests. People rarely know their interests. Public support is, nonetheless, a common and often necessary justification for policy in democratic states. Expensive, cruel and unproductive criminal justice policies are quite often pursued in defiance of the vast majority of expert advice because they command “public support” (which often translates as the support of the right-leaning media who would otherwise try to whip up public hysteria). However, I suspect fisheries are an issue where defying public opinion would be unlikely to seriously damage a national government, in which case one might hope considerations of good policy would take precedence. If there is any benefit to be salvaged from the disastrous overfishing of the bluefin tuna (see “The Bluefin in Peril,” by Richard Ellis), it’s the spotlight that it shines on the plundering of the world’s marine life. It has been 16 years since the demand for cod led to the collapse of the once superabundant cod fisheries in the North Atlantic off Newfoundland. Disappearing with them were some 40,000 jobs. Seafood Watch, an online information clearinghouse run by the Monterey Bay Aquarium in California, has placed all Atlantic populations of flatfish, including flounder, halibut, plaice and sole, on a list of fishes that it urges consumers to avoid. The list goes on. You can’t entirely blame the fishers. Yes, a lot of pirates are out there, taking fish illegally, underreporting their catches, fishing under the flags of countries not party to international fishing agreements. But for many cultures, fishing is a way of life—and sadly, because of overfishing, a hard way to carry on. The lure of dollars—or euros or yen—becomes all but irresistible when the alternatives become ever more limited. As Ellis reports, a single bluefin tuna fetched $173,600 in Tokyo, and prices of a sushi dinner for two in New York City can reach $1,000. With that kind of money at stake, it is hardly surprising that industrial-scale technology has caught on, big time. Hooks are paid out on “long-lines” more than 50 miles in length. Factory ships that can hold 1,000 tons of fish store and process the catches. Fishing on such a massive scale can quickly exhaust a fishing ground, but when that happens, the factory ships just move on. As a result, fisheries themselves are becoming ever more remote. The bottom of what is known as the continental slope, between 600 and 6,000 feet deep, is home to several species that swim in schools and grow as long as two to three feet. Their presence opened up the continental slope to industrial deep-sea fishing that pays off handsomely. The usual method, known as bottom trawling, is to drag a large cone-shaped net, weighted with 15 tons of gear, across the seabed. The net catches everything in its path, and the gear crushes any 1,000-year-old coral that stands in its way. What are the environmental costs? No one really knows—and that is part of the problem. According to Richard L. Haedrich, an ichthyologist writing in a recent issue of Natural History, catch quotas for deep-sea fishes were set “essentially by guesswork, relying on … knowledge of shallow-water species. They took no account of the far slower turnover rates in a typical population of deep-sea fishes.” The predictable result is that two deep-sea species have already been depleted: the orange roughy, formerly known as the slimehead, and the Chilean sea bass, aka Patagonian or Antarctic toothfish. When they’re gone, Big Fishing will pack up and move on once again. even extensively damaged over large areas of fishing grounds. with highly destructive gear such as trawls, dredges and traps. world, documenting the severe long-term impacts of trawling. needed given the cumulative threats that the oceans are facing. UNITED NATIONS — Planning began here yesterday for a sweeping review of a 1995 treaty on management of migratory fish stocks — a response to recent scientific reports that fishing yields are no longer sustainable. Scientists fear that stocks of many prized species — particularly Atlantic bluefin tuna — are in imminent danger of collapse. But governments so far have focused on fisheries management and oversight within Regional Fisheries Management Organizations (RFMO) rather than moving toward a more global and legally binding management regime. The U.N. Food and Agricultural Organization, the U.N. Environment Programme and several private scientific studies indicate that most of the world’s fisheries are either fully exploited or overexploited. Harmful fishing practices like bottom trawling have come under fire from conservationists and governments in the past. RFMOs have been criticized for lax rules and weak enforcement, and the European Union has recently come under the spotlight for its failure to combat illegal fishing in its waters. But U.N. negotiations on fisheries are proceeding slowly and have at times deadlocked despite evidence of what many scientists believe is a looming food crisis. Western Hemisphere and South Pacific governments appear more willing to accept aggressive regulations, while Asian and European states have demonstrated less urgency in deliberations. This year the United Nations is expected to focus mostly on illegal, unreported and unregulated fishing on the high seas. A resolution adopted by the General Assembly last year called on states to enact strict permitting for their flagged vessels to fish in international waters. The United Nations is also considering drawing up a global list of vessels permitted to operate in the high seas and a “black list” of vessels suspected of illegal fishing practices. Nine key RFMOs manage the exploitation of migratory fish stocks, the most famous of which are the International Commission for the Conservation of Atlantic Tunas (ICCAT), the Northwest Atlantic Fisheries Organization (NAFO) and the Indian Ocean Tuna Commission (IOTC). Some of the regional blocs are considered by conservationists to be reasonably successful, while others, especially ICCAT and other tuna commissions, seem incapable of acting on alarming trends. ICCAT in particular is under fire for routinely ignoring the advice of its own scientists and setting European bluefin tuna catch quotas at double the recommended limits. Atlantic bluefin tuna is used almost exclusively for the highest-grade sushi and sashimi and is one of the most valuable fish species in the world. Bluefin fisheries in the West Atlantic and Gulf of Mexico have failed to recover to past levels despite a decade of aggressive management efforts by the United States and Canada. A study last year by the Census of Marine Life showed that gulf bluefin migrate and feed in the same fishing grounds as Atlantic bluefin, where they are caught in large quantities by Spanish, French and Italian fleets. Most bluefin is sold for export to Japan. Many countries are also pushing for a global review of all RFMOs to identify which are performing the best or worst and to disseminate best practices worldwide. The U.N. Conference on Straddling Fish Stocks and Highly Migratory Fish Stocks, otherwise known as the Fish Stocks Agreement (FSA), was drafted and finalized in August 1995 in an attempt to standardize conservation approaches, RFMO practices, scientific research and cooperation and enforcement of regional and international fishing laws. It is largely seen as an addendum to the 1982 Law of the Sea convention, which was designed more to address territorial and navigation issues. While not a member of the Law of the Sea convention, the United States was one of the first nations to sign and ratify the FSA, acceding in mid 1996. But membership has been a key problem for the success of the treaty. Whereas the Law of the Sea has 155 full members, the FSA has so far gathered 68 state parties, with the Republic of Korea the last to join in February of this year. It is hoped that continuing informal discussions and the 2010 review conference will encourage more members to join. But the key issue looming is how to get governments and RFMOs to rein in illegal fishing, fishing overcapacity and the spread of dead zones that threaten some of the most valuable fishing grounds. ““Our analysis”, said the authors, Ransom Myers and Boris Worm of Dalhousie University in Canada, “suggests that the global ocean has lost more than 90% of large predatory fishes.” These are the ones, cod, groupers, salmon, tuna and so on, that everyone likes to eat. Critics also question whether total ecological recovery really has been achieved as often as Ms Jones and Dr Schmitz suggest, and point to examples where it manifestly has not, such as the cod fishery of the Grand Banks, off the coast of Newfoundland, which collapsed in 1992. Almost two decades on, the cod show no sign of recovery, perhaps because new predators, such as dogfish, now dominate the waters. Our oceans have been the victims of a giant Ponzi scheme, waged with Bernie Madoff–like callousness by the world’s fisheries. Beginning in the 1950s, as their operations became increasingly industrialized–with onboard refrigeration, acoustic fish-finders, and, later, GPS–they first depleted stocks of cod, hake, flounder, sole, and halibut in the Northern Hemisphere. As those stocks disappeared, the fleets moved southward, to the coasts of developing nations and, ultimately, all the way to the shores of Antarctica, searching for icefishes and rockcods, and, more recently, for small, shrimplike krill. As the bounty of coastal waters dropped, fisheries moved further offshore, to deeper waters. And, finally, as the larger fish began to disappear, boats began to catch fish that were smaller and uglier–fish never before considered fit for human consumption. Many were renamed so that they could be marketed: The suspicious slimehead became the delicious orange roughy, while the worrisome Patagonian toothfish became the wholesome Chilean seabass. Others, like the homely hoki, were cut up so they could be sold sight-unseen as fish sticks and filets in fast-food restaurants and the frozen-food aisle. The scheme was carried out by nothing less than a fishing-industrial complex–an alliance of corporate fishing fleets, lobbyists, parliamentary representatives, and fisheries economists. 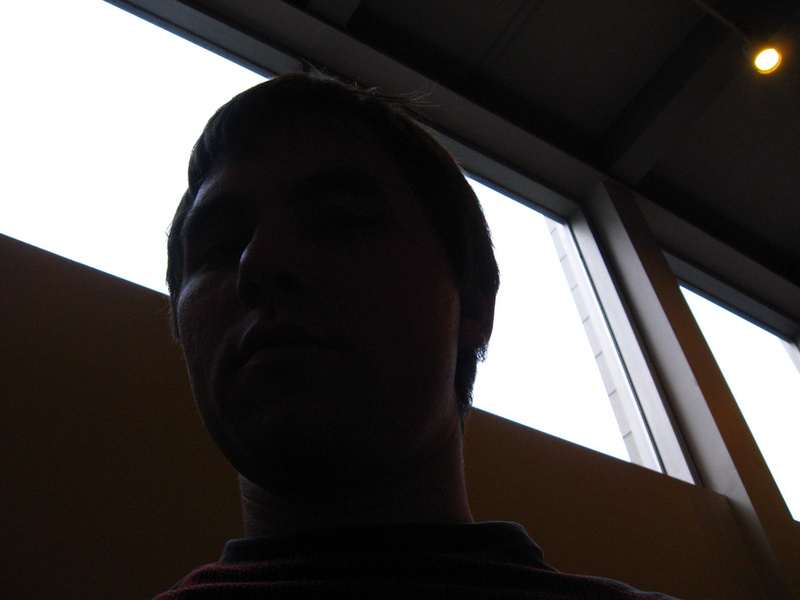 By hiding behind the romantic image of the small-scale, independent fisherman, they secured political influence and government subsidies far in excess of what would be expected, given their minuscule contribution to the GDP of advanced economies–in the United States, even less than that of the hair salon industry. In Japan, for example, huge, vertically integrated conglomerates, such as Taiyo or the better-known Mitsubishi, lobby their friends in the Japanese Fisheries Agency and the Ministry of Foreign Affairs to help them gain access to the few remaining plentiful stocks of tuna, like those in the waters surrounding South Pacific countries. Beginning in the early 1980s, the United States, which had not traditionally been much of a fishing country, began heavily subsidizing U.S. fleets, producing its own fishing-industrial complex, dominated by large processors and retail chains. Today, governments provide nearly $30 billion in subsidies each year–about one-third of the value of the global catch–that keep fisheries going, even when they have overexploited their resource base. As a result, there are between two and four times as many boats as the annual catch requires, and yet, the funds to “build capacity” keep coming. My former supervisor/now boss (and OG of overfishing) has a piece out in The New Republic with the wonderfully garish title of Aquacalypse Now. He explains how the fishing industry can contribute a minuscule amount to the GDP of advanced economies — less than hair salons — and yet have managed to wield a disproportionate amount of political power. Read the whole article here but beware: NOTHING is as bad as harpooning a manatee. Can the world stop governments from paying for the over-exploitation of fish? 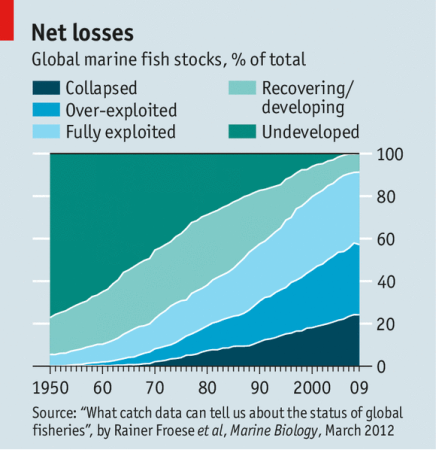 OVERFISHING erodes future prosperity by destroying today a resource that could yield benefits indefinitely. Yet it is subsidised by billions of taxpayer dollars, euros and yen. Now a new chance to halt this insanity has emerged in the unlikely form of climate-change negotiations. Landlubbers hand pots of money to fishermen. Rashid Sumaila, a researcher at the University of British Columbia, estimates that in 2003 (the most recent year for which data are available), the world’s fishing subsidies were $25 billion-30 billion. The value of fish landed in the same year was $82 billion. Furthermore, Dr Sumaila reckons that $16 billion of the subsidies either promote overcapacity by helping fishermen buy new or bigger boats or encourage overfishing by subsidising fuel. In theory, this problem could be sorted out by the World Trade Organisation (WTO). But the issue has languished over the years and the current Doha round of trade negotiations remains moribund. Oceana, an environmental pressure group, argues that the subsidy of fisheries should now be “decoupled” from the Doha round. Victor do Prado, deputy chief of staff at the WTO, thinks the chances of that happening are slim. “Fisheries is part of the overall Doha mandate,” he says. “As long as this issue is treated within the WTO it is difficult to decouple it from the rest of the round dossiers. What would countries like Japan and Korea be gaining by decoupling?” In other words, a global deal on fisheries subsidies is unlikely because countries such as China, Japan, Korea, Taiwan and Spain—all of which have large fishing fleets—do not want to cut subsidies. When I asked one of Canada’s Department of Fisheries biologists for his summation of the current state of affairs, he lost his temper. ACIDIFICATION, warming, the destruction of coral reefs: the biggest problems facing the sea are as vast, deep and seemingly intractable as the oceans themselves. So long as the world fails to cut its emissions of greenhouse gases, cause of the global warming behind these troubles, they will grow. By comparison, overfishing, another great curse, should be easier to put right, especially in the coastal waters where most fishing occurs. And yet it goes on, year after year. Fishermen have every reason to do something. Many fisheries are hurtling towards collapse; stocks of large fish have been reduced by up to 90%. When stocks are overfished, they yield a smaller catch. The cost of mismanagement, in lost economic output, is huge: some $50 billion a year, according to the World Bank. One reason why the pillage continues is that knowledge of fish stocks is poor, especially in developing countries. A new statistical attempt at estimating the remaining shoals (see article), from the University of California, Santa Barbara, is therefore welcome—even if that is not true of its findings, that stocks are even more ravaged than previously thought. The study found that better-understood fisheries are likelier to be healthy. Another reason for overfishing is new technology (developed, aptly enough, for battlefields), which makes shoals easier to detect. As large boats and refrigeration have spread, fishing fleets have covered greater distances and hoovered up larger catches. Because technology lets fishermen fish with less effort, it disguises just how fast the stocks are depleting. The World Bank announced on Friday a global alliance to better manage and protect the world’s oceans, which are under threat from over-fishing, pollution and climate change. That these turn out to be exceptional cases is unsurprising. The rapacious habits of fishermen and perverse effects of the subsidies some extract from governments are well known. Sometimes overfishing stems from ignorance and sometimes from short-termism, exacerbated by the belief that whatever they don’t take, others will. The cost is enormous. Besides harbouring millions of species, fisheries provide the primary source of protein for a billion people and livelihoods for hundreds of millions, most of them poor. The World Bank reckons that benefits (such as income and food) lost by overfishing between 1974 and 2008 amount to $2.2 trillion. WITH over 4,000km (2,500 miles) of coastline, it is no surprise that fishing is one of Chile’s leading industries. Its commercial catch is the world’s seventh-largest. Following a period of brutal overfishing, Chile set up a quota system in 2001, which helped stocks stabilise. However, that law expires at the end of 2012. The government has yet to devise a new system that satisfies everyone. All these disputes must be settled soon in order to protect Chile’s fragile fishery. From 1995 to 2011, the jack mackerel catch fell by 94%. Some scientists say the stock will need a century to recover. Overfishing has wrought havoc with global stocks of eels, prompting America to recommend that several species of eel be put on an international endangered list. That was front-page news in Japan. Greenpeace listed species of eel as endangered two years ago, joining sharks, bluefin tuna and Atlantic cod. Rebuilding global fisheries would make them five times more valuable while improving ecology, according to a new University of British Columbia study, published July 13 in the online journal PLoS ONE. By reducing the size of the global fishing fleet, eliminating harmful government subsidies, and putting in place effective management systems, global fisheries would be worth US$54 billion each year, rather than losing US$13 billion per year. Despite the US$130- to US$292-billion price tag for transitioning global fisheries, the study’s authors estimate that in just 12 years, the returns would begin to outweigh the costs and the total gains over 50 years would return the investment three- to seven-fold. By the 1980s the herring had become scarce. Yet the tides that make the Clyde perilous for mariners also stir up nutrients, making it rich in biodiversity. So the fishermen turned to other species—saith, cod, plaice and sole—assisted by bigger engines and new dredgers. The Clyde fleet, based in Carradale, Girvan and other small ports along the Firth’s 100km stretch, could now fish deeper, for longer, and even in rocky places. Though the fuel needed to get to the high seas is pricey, taxpayers often pick up part of the tab in the form of government subsidies. Such subsidies, combined with overexploitation of fisheries closer to land, have made the high seas attractive to fishermen. The consequence, according to the UN’s Food and Agriculture Organisation, is that they, too, are being pillaged. Already, two-thirds of their stocks are being fished beyond sustainable limits and, as they once provided a haven for fish everywhere, yields in EEZs are suffering, too. Translating these numbers into fishing practice can be hard. For example, two species with the same unfished biomass may, because of their ways of life, be under different levels of strain from net-casters. Fishing optimally for one might threaten the other. But data on by-catch—species netted that are not a boat’s main quarry—which would illuminate such differences, are difficult to come by, for countries are often loth to share them.